Every recipe for this type of flatbread calls for raw onion inside the bread. I think this makes for a harsh bite, which is why I saute the onion first before folding it inside the dough. I’m not sure if I can adequately express how much I love this preparation. The initial thought might be to use it with a tagine (it is perfect for that). But, it has so much flavor by itself that I can eat one without anything else (and probably want another one). Dissolve yeast in warm water with 1/2 cup of yogurt in a large mixing bowl; let stand 5 minutes. Add flour, remaining yogurt, and 3/4 teaspoon of salt to yeast mixture; stir with a mixer equipped with dough hooks or use a wooden spoon until smooth. Turn dough out onto a lightly floured surface; knead a few minutes, until flour is fully incorporated. Shape dough into a ball; spray inside of a bowl with cooking spray and place the dough ball inside it. Seal bowl with plastic wrap and allow to rest at room temperature for at least an hour. Heat a pan on medium with 1 teaspoon of canola oil. Saute the onions in the pan for a few minutes, until the onions become translucent. Allow to cool before proceeding to next step. Combine onion, parsley, 1 teaspoon of olive oil, paprika, cumin, 1/2 teaspoon of salt, and crushed red pepper. Mix thoroughly into a paste. Cut dough into 10 equal portions. Start with one portion and cover remaining dough with a wet kitchen towel to prevent drying. Using a well-floured surface, flatten each portion until very thin and shape into a square. Spoon 1 tablespoon onion mixture in center of dough. 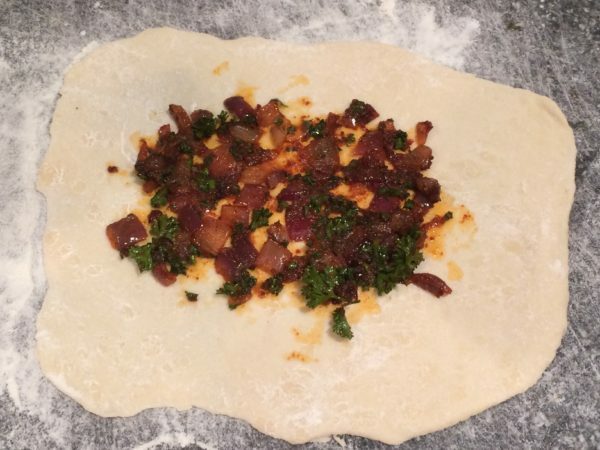 Fold left and right sides of dough together until they meet in the middle. Fold top and bottom sides together in the same way, wetting the dough if needed to get the flaps to stick. Press down and reshape the dough to form a square. Repeat for remaining dough portions and onion mixture. 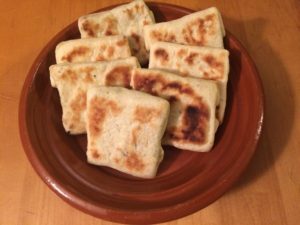 The Greek yogurt makes for a lighter bread, but also makes it sticky and much harder to work with. Make sure to keep the work surface dusted with flour to prevent sticking. 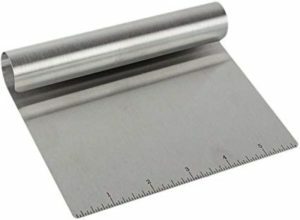 Use a bench scraper (see below) to loosen the dough from the surface if needed.